I'm looking forward to buying one of those mini-imaging printers. Here is a table of this article comparing some of them. (At least) Instax SP-1 and Kodak Mini 2 are missing. 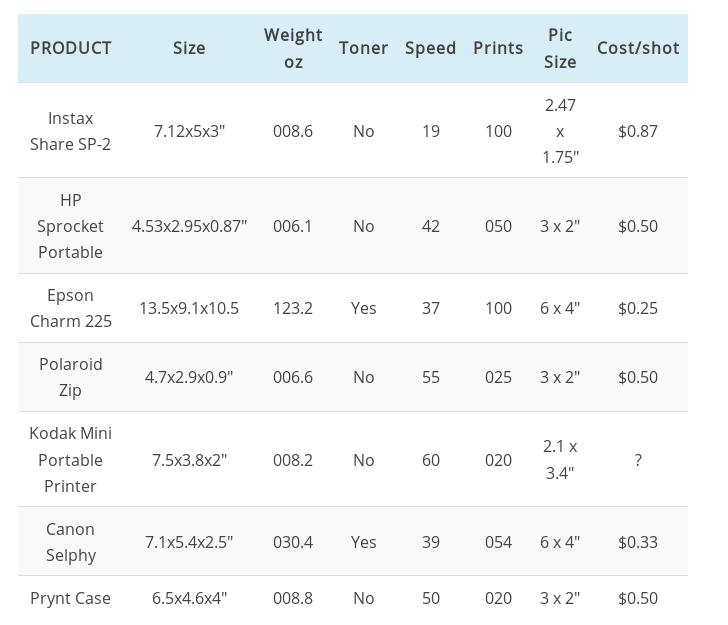 I would like to print images directly from my Canon 70D to the printer, but I am not sure if all of these are compatible. The 70D only has Wi-Fi, so there's no Bluetooth or NFC, which rules out some. But what about those who have Wi-Fi? I could barely find anything in those that do not involve only a smartphone to the printer, only the user manual of Canon Selphy shows instructions on how to send images directly from a DSLR camera. That is definitely too big to be considered "mobile" for me, however. So, my question is: Which mobile instant-imaging printers are compatible with Canon (DSLR) cameras that do not have wireless connectivity other than Wi-Fi?